Lauren Fey at the plate for Butler. Fey had six hits and drive in five runs in the three-game series against DePaul. Photo by Jimmy Lafakis. 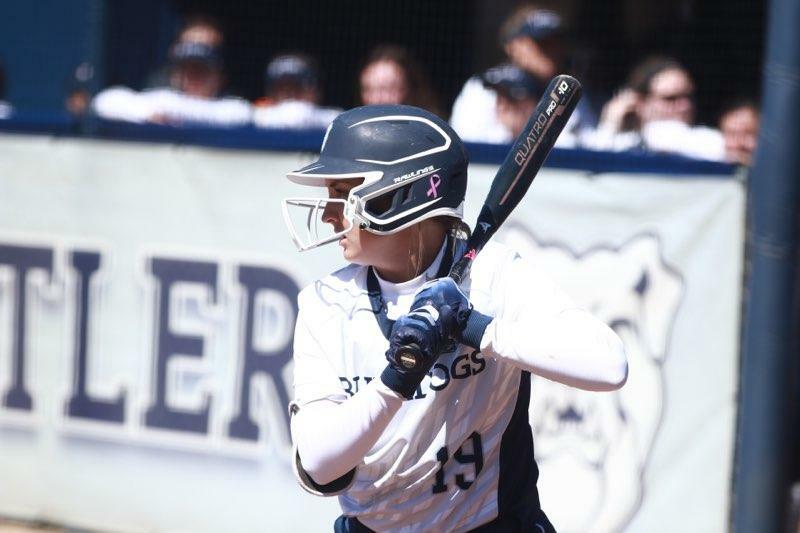 The Butler softball team went 1-2 in its series against DePaul to open Big East conference play on March 23 and 24 to move to 10-19 on the year. The Blue Demons were able to win both games of the Saturday doubleheader before Butler took the final game of the series to avoid the sweep. Freshman outfielder Lauren Fey continued her recent tear at the plate in the three-game set as she had six hits across three games and brought in five runs. Fey has 11 hits in her last 19 at-bats. Fey got the Bulldogs on the board first in the second inning Sunday. Butler loaded the bases with two outs and Fey skied a single over third base to plate two runs for the Bulldogs. After DePaul scored their lone run of the game in the top of the third, Claire Gilliland opened up the game as she brought in two more runs in the bottom half. The Blue Demons were charged with a throwing error at first that could have ended the inning. Instead, Gilliland doubled to center field and gave Butler a 4-1 lead. In the circle, it was sophomore ace Alyssa Graves leading the way for Butler. She overcame a first inning that saw her throw six straight balls to open the game to pitch a complete game for the Bulldogs. Following seven strikeouts on Saturday, Graves struck out six batters and allowed just three hits. Butler manufactured three more runs in the bottom of the fifth off four hits and a DePaul error. Elyse Babb grounded into an RBI for the final run. Sunday’s win followed an 0-2 performance in the Saturday doubleheader with the Blue Demons. The Bulldogs fell 8-5 in game one and 6-3 in game two to open the series and allowed four home runs. The two losses were not due to a lack of offensive output from the Bulldogs as Butler had 18 hits across both games. On the other hand, Butler left 17 runners on base in two games. Kaitlin Doud doubled into left-center to get Butler on the board first in game one. DePaul answered in the next half inning as Morgan Greenwood plated two runs with a double of her own. The Blue Demons would go on to score one more unanswered run off a home run to center field from Skylor Hilger. Butler had the DePaul lead to just a run after singles from Sammy Andersen and Doud in the fifth inning. DePaul answered with a three-run sixth inning that brought Graves out of the game. Graves went 5.1 innings before Doud came in to relieve. The Bulldogs tried to rally in the sixth inning but left the bases juiced as Karli Ricketts went down swinging. Butler loaded the bases for Fey who singled to plate a run. Christina Candotti also singled to make it 7-5 after six. DePaul scored one more run in the top of the seventh to make it 8-5. Butler left runners on the corners to end the game. Ricketts got the start in game two. The Blue Demons jumped out to a 3-0 lead without Butler recording an out in the game. DePaul led off the inning with a single from Angela Scalzitti. They followed it up with back to back home runs off Ricketts to make it 3-0. The rocky first inning resulted in Doud coming in to pitch the final 5.1 innings. With both games combined, Doud pitched a complete game and only allowed three earned runs. After single runs in the second and fourth innings, Butler was down 5-0 before they got on the board. Maddie Moore and Fey were responsible for all three RBI off singles. The Blue Demons were able to notch one more home run in the 6-3 win that saw them post 16 hits. Morgan Greenwood belted one on a solo shot to center in the 7th. Following their series with DePaul, Butler will play a pair of mid-week games against Evansville and Illinois-Chicago. The Bulldogs will spend their second straight weekend at home to open Big East play as they take on Villanova.